My local writer’s group holds a recitation evening at this time of year, when people seem drawn to old stories and songs and poems. The poem below, although not traditionally wintry, is my own favourite for this season. Almost a short story, the poem was written by Robert Louis Stevenson, who was the son of a lighthouse engineer, and appeared in 1888 after the publication of his Treasure Island. 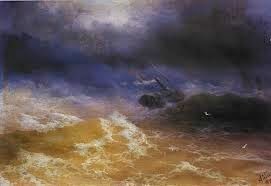 Although the poem seems to be about danger at sea, the emotional conflict and longing seem to me a deeper part of the celebration itself, whether on land or sea. Please, if you have a moment, do read through to the end. And cliffs and spouting breakers were the only things a-lee. But 'twas only with the peep of light we saw how ill we lay. And we gave her the maintops'l, and stood by to go about. For very life and nature we tacked from head to head. And the coastguard in his garden, with his glass against his eye. And I vow we sniffed the victuals as the vessel went about. And the house above the coastguard's was the house where I was born. Go dancing round the china plates that stand upon the shelves. To be here and hauling frozen ropes on blessèd Christmas Day. They lit the high sea-light, and the dark began to fall. 'All hands to loose top gallant sails,' I heard the captain call. 'By the Lord, she'll never stand it,' our first mate, Jackson, cried. … 'It's the one way or the other, Mr. Jackson,' he replied. And the ship smelt up to windward just as though she understood. We cleared the weary headland, and passed below the light. Was just that I was leaving home and my folks were growing old. The Awfully Big Blog posts are mostly about fiction, but there are poetry readers and writers too. What’s the title - and author - of your favourite poem at this time of year? Both the painting and the poem are new to me and both are so powerful! I think I'd have to choose Christina Rossetti's In the Bleak Mid-Winter, especially the first verse. Yes, Joan, especially sung by a young voice in the air of a cold church. Ah, yes, but to which tune? Thank you, Penny. I'm a big RLS fan, but I'd never read that! What a punch that last line has. You've done me another favour.